In putting together my ‘Unsung Muses’ installation, I have had some generous help from a number of companies and I just want to say thank you. Pfaff very kindly have lent me a Creative 4 sewing and embroidery machine. It is really fabulous, with everything at the touch of a button. I still haven’t had time to explore the possibilities of the embroidery unit yet and I’m looking forward to doing this over the next few months after the Festival of Quilts. Also, they have been great at supporting me with technical help both from Sheila and Jamie. Aurifil have given me lots of different threads, which have formed the mainstay of my stitching on these pieces. The thread has proved great, with few breakages and lovely coverage. Vilene gave me a roll of heavyweight iron-on Vilene which has proved a fantastic support for some of the work. Finally, Jane Rae of Cinnamon Publishing helped me hugely with my press release and getting a marketing strategy together; pushing me to do far more than I would have done otherwise. Thank you to all of you for your support. I really appreciate it. It's Sunday. Day of rest and relaxation for most. For me, however, it's been a full day of work. Whilst R and the kids have been outside enjoying the sunshine, I've been working hard in my lovely new studio. On the weekends when I get full days of work, I've developed a good working rhythm in the past few weeks. One album worth of stitching on the sewing machine, then 30mins of painting listening to a radio programme on BBC's fabulous listen again function. My sewing machine is too noisy to listen to speech radio whilst stitching and I need to keep moving and changing activities to stop my shoulder going stiff. Today's great mix was Keane, Kasabian, Kaiser Chiefs and The Killers, interspersed by the topical political comedy The Now Show, an episode of Front Row, a murder mystery called Baldi and I'm now part way through The Pale Horse by Agatha Christie. All fun to listen to, but what about the work? I added details to several figures using oil stiks, having stitched the outlines in place. I have machine quilted part of a panel of one of the triptychs. I also started the final stitching on two of the figures. Not bad going and I still haven't finished! I'm just on a little break to watch the end of the Tour de France. I think Unsung Muses has 18 pieces in all for the exhibition. And yesterday, I finally completely and totally finished Figure 1. Only 17 pieces left to go. That makes it sound like it is a complete fantasy that I will get it finished on time, but somehow, completing this one and seeing that it works, has actually quelled the butterflies that have been eating away at me for the past few weeks. I’m heading towards serene... until one of the kids interrupts my stitching again and I’ll revert back to grumpy mummy. Although I still have seventeen to complete, three only need hanging sleeves, one only needs three toes stitched and most of the others are near final stitching. There are only two that are still a long way off. When I put it like that it sounds easy! I’m on the countdown to the Festival of Quilts now. I have 17 days before I leave to go and hang the work. Obviously by this stage, I have got it all completed, packed, piles of postcards and other small items ready to go... if only! As usual, I’m on my last minute mode. I would like to think I will learn something from the experience of making this body of work. Already, I can see the two main lessons are ‘don’t be over ambitious’ and ‘remember everything takes much longer than you think it will, so leave plenty of time.’ Good sound lessons, but this could be referring to my last project and the one before, so obviously these are two lessons I am incapable of learning! However, hopefully it leads to quality work. I posted my press release yesterday, but what does the work look like? Do you remember a few months ago, I showed you this cloth? It was pieced together from lots of off-cuts and old clothes. Well... now it looks like this. It forms part of one of the two triptychs I’m showing at the Festival of Quilts. 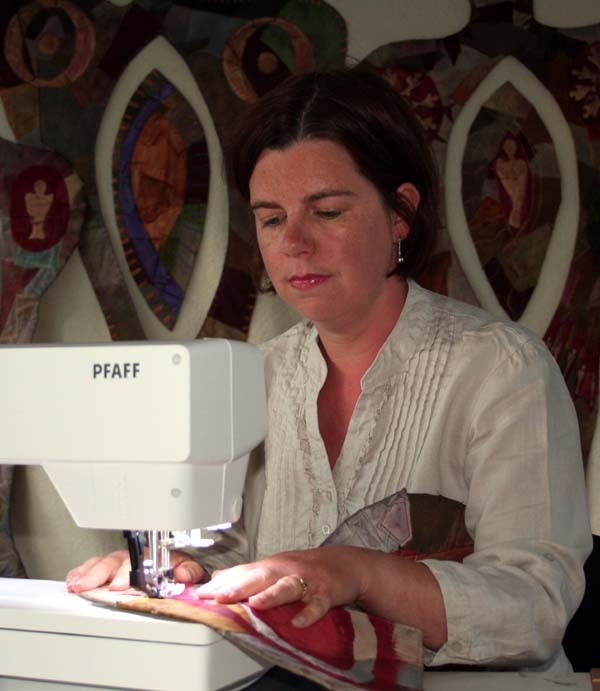 Scottish textile artist Gillian Cooper is introducing a new dimension to this year’s Festival of Quilts being held 11-14 August at the Birmingham NEC. Visitors to the show will be able to walk through her exhibition space, virtually rubbing shoulders with the ethereal life-sized figures that she has created in her piece entitled “Unsung Muses”. The installation, consisting of quilted pieces, floating figures and transparent hangings, celebrates the lives and influence of our female ancestors and forgotten goddesses - the “unsung muses” who have shaped the lives of so many women today. Gillian has incorporated the notion of time passing by creating outlined rather than detailed figures, almost hovering under layers of embellishment and organza; slightly obscured but never forgotten. “The idea of what is needed to give a shape human form has fascinated me for ages and this was a way of exploring it. How little is required to give an outline a sense of human presence? A number of years ago, I explored the idea by looking at dolls, but I couldn’t get it to work for me. With these figures, I found a stronger connection”, said Gillian. The figures are pieced from a variety of over-painted and hand-dyed fabrics and incorporate discarded clothes and remnants from earlier projects. Once the figures were pieced, further detail was added using oil sticks and extensive machine quilting. 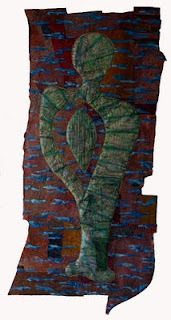 “I hope that ‘Unsung Muses’ will strike a chord with many of the visitors to the show helping them to reconnect with the fabulous goddesses and winged angels that are part of their own narrative”, said Gillian. If you know of anyone who would be interested, please pass it on. The Festival of Quilts is approaching at a very fast rate. I now have every work in progress, with some basically complete and others which have a bit further to go. Our annual holiday was curtailed a bit so I spent a week working at home whilst R played with the children on beaches in Northumbria. The day I left to come back I had been on the beach at 6.30am with a four year old who refused to sleep. It was beautiful, but I did feel incredibly guilty at leaving R to cope with this on his own. Luckily she improved and I got a great weeks work down, making another four figure shapes as can be seen here underway. Everything takes longer than I think it will - especially the pinning of all the fabric onto the shape. The figures are all pieced and are now having details added to them. My arms are permanently covered in oil paint and I am dashing into the studio for the odd ten minutes whilst the children entertain themselves - ten minutes seems to be the maximum without resorting to 'screen time'!